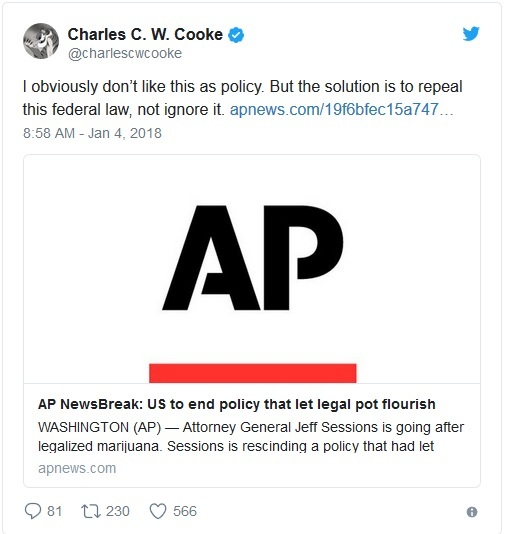 I wish more politicians who smoked pot in college and yet later on down the road want to enact policies to punish us if we did the same thing were called out over their hypocrisy. Either abide by the same laws that you enact for the rest of us or get rid of these laws. Carfentanil or carfentanyl is an analog of the synthetic opioid analgesic fentanyl. A unit of carfentanil is 100 times as potent as the same amount of fentanyl, 5,000 times as potent as a unit of heroin and 10,000 times as potent as a unit of morphine. The toxicity of carfentanil in humans and its ready commercial availability has aroused concerns over its potential use as a weapon of mass destruction by rogue nations and terrorist groups. Drug laws, just like laws against prostitution, are absurd. It should not be legalized. It should be totally decriminalized. Any and all laws related to it should be repealed.. I don’t see the quandary. While rule of law is essential, the Constitution (mostly the Ninth and Tenth Amendments) don’t delegate drug regulation to the Federal Government. As such, the Schedule 1 drug laws are, on the face, not Constitutional. This kind of arbitrary approach to enforcement of federal law isn’t uncommon in situations which present a Constitutional quandary. So I would disagree with the quandary’s existence – if the Federal government doesn’t have the right to regulate drugs (it doesn’t), then it doesn’t have the right to overrule or interfere in areas where the states’ rights prevail. My issue is what Sessions is doing with his time. Certainly he has bigger fish to fry? Having said that, I think you hit the nail on the head. We are in a quandary as to whether to uphold the law or to selectively ignore it. A slippery slope there. The only other consideration is that the founders made it clear that any law outside the limited powers of the federal government is both unenforceable, and illegal. So, it seems the states are within their rights to go against it. Perhaps as some advocate, the only answer is for a constitutional convention in which the states can knock the federal government back into its constitutional position. The founders intended that the federal government’s powers be severely limited, and clearly stated so. Over time, the supreme court and congress has eroded that intention. My vote is that we repeal the 17th amendment. The intent of the senate was that senators would be those who represented states’ rights at the federal level. They were to be appointed by the states to protect those rights. The 17th allowed that they be elected by the citizens, thus becoming a simple (and more powerful) version of the house of representatives. Let’s get the states back to their rightful position at the table. Note that this would also effectively create a term limitation, as it is doubtful that state governments would continue to appoint the same senators over and over. Folks like Mitch McConnell would be beholding to his state’s legislature, and would be replaced on the next go-around of state elections. This might create some cronyism at the state level, but it sure as heck beats cronyism at the federal level. This amendment more than any other has had a profound detrimental effect on the structure and direction of our government. Where’s the quandary? The 10th not only says it’s nothing to do with the Feds, it says it’s “reserved to the people.” So doesn’t the Constitution say each person has the right to decide for himself? An ethical libertarian will deny any right to impose his views on others and deny support to anyone so attempting. No conundrum anywhere! I think the federal law will be repealed – as a natural consequence of more states passing laws legalizing the drug. We should support these measures vocally so that this happens. It is none of the governments’ business what someone puts into their body – even if the substance may be harmful.